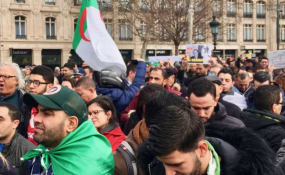 Algerians protested at the Place de la Republique in central Paris against Bouteflika's intention to seek another term in office. Algiers — President of the Republic Abdelaziz Bouteflika received Monday, in Algiers, Prime Minister Ahmed Ouyahia who tendered his resignation to him. The head of State thanked Ouyahia for the efforts he has made during his tenure as prime minister.